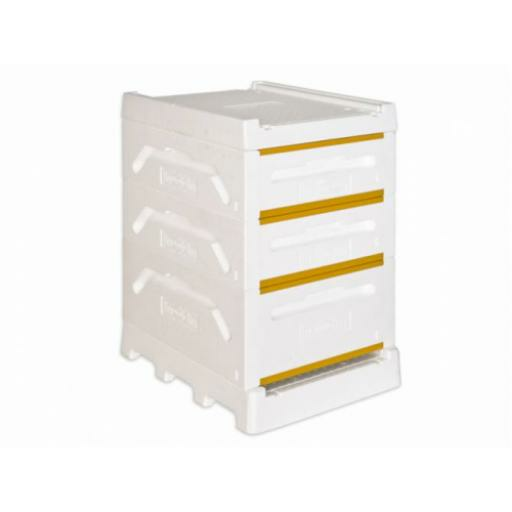 Our Polystyrene (Poly) hives offer exceptional thermal performance and durability whilst maintaining an ergonomic design. This means a higher honey production compared to wooden hives, but with minimal weight. These types of polystyrene hive do not use crown boards, instead we have an in built feeding system for fondant so that you don't need an eke. This hive has a 295MM deep brood body which takes 10 langstroth jumbo frames. Langstroth jumbo frames are the same width and depth as dadant and thus give a large brood area plus plenty of space for stores for over-wintering. Dadant hives were favoured by brother adam of buckfast abbey but the full dadant hive is very heavy, this jumbo langstroth in high density polystyrene has fewer frames than a dadant and is therefore lighter but still offering plenty of space for the queen. This is probably the most technically advanced hive currently available in the UK. The material of construction, high density polystyrene, now dominates the market in many part of europe and there are tens of thousands of hives like this in use and the british beekeeper can be reassured this is a high quality product that works. The hive is designed for a working life of at least 30 years and will take a lot of hard use, such as migratory beekeeping. Designed and supplied by Paradise Honey ltd of finland the hive represents the culmination of years of experience and research into the development of the perfect bee hive.